750 mL bottle. Pours a little hazy with an orange body and no head. Smells of strong peaches. Some acidity. Tastes of peaches. Sharp sourness. It’s got just a little bit of rubber. Peaches last into the aftertaste. Very intense. Low carbonation. Like other Cut treatments, it’s got some autolysis going on. 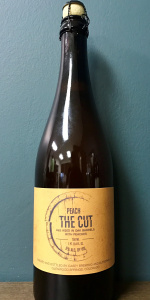 Peach skin on the nose. Light and crisp body. Clean lactic tartness across the drink. A full bodied peach flavor from skin to flesh to pit. Quenching dryness. Wow, the smell on this is "Kick you in the balls" peach. It's got the perfect amount of funk in the nose as well to really bring out what is just an overall fantastic smelling beer. The look is gold with just a slight haze. When it comes to sour peach beers, the best looking one I've ever had is Curious 6, so I gotta give the upper hand to that brew. The taste is straight peach, with a great cheezy funk and tartness to compliment the backbone. Not too tart or funky. Just the right amount. Mouthfeel is fluffy and fantastic. A gentleman at the tasting who is unable to taste or smell said it's probably the best mouthfeel in a beer he's ever had. Thought that was interesting. Overall this is probably my favorite Casey beer I've had since Raspberry CFP. I honestly might like this one more to be honest.